Our GI Bill® Supports Education Benefits Programs Offered by the Department of Veterans Affairs and Defense at Northwest, an Accredited School In Las Vegas. 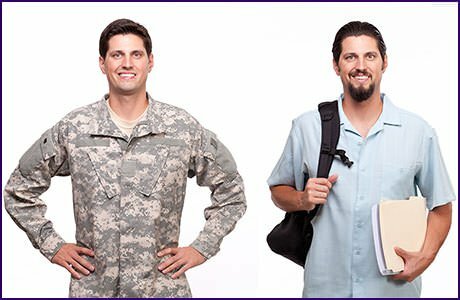 Military Tuition Assistance is a program provided by the military to help subsidize the cost of tuition for soldiers who are currently serving on active duty. Military TA may be available to students actively serving in all branches of the military in an active or reserve status. TA is not a loan; it should be viewed as money you have earned just like your base pay. If you are currently serving in the military, you may be eligible for funding offered through the Department of Defense Tuition Assistance program. Check your eligibility status and the amount for which you qualify with your Service prior to enrolling in a college in Las Vegas approved by the State Approving Agency of Nevada for VA Education Benefit Programs. Northwest Career College has a staff of trained and knowledgeable Benefits and Financial Aid Officers on staff that can help package the best benefits and financing options for veteran funding in Las Vegas. We understand the importance of your education and want to help you maximize your earned benefits. We would never want finances to be a stressor during this fun and exciting time in your life so let us help you put your mind at ease. Northwest appreciates the sacrifices that our active duty, guard, reserves, veterans, spouses and military dependents make as they serve our country. Northwest commits our entire staff and faculty to you and your family for all of their educational needs. At Northwest, your family becomes our family and we remain…committed for life. We can’t wait to hear from you! Northwest Career College is approved for the Training of Veterans, Active Duty, and their Families. Northwest Career College is approved by the State Approving Agency of Nevada for VA Education Benefit Programs. If you believe you are eligible, contact the VA at 888-442-4551 FREE or www.gibill.va.gov to confirm your eligibility and begin the process of activating your benefits.